Propedeutics and Motivation. Urbanisation in developing economies is finally starting to get the recognition that it deserves within the profession. Apart from the recent special issue in the JoUE edited by Glaeser and Henderson (2017), there finally is a paper that provides a theoretical explanation for how poor megacities can come about: Jedwab and Vollrath (forthcoming) in the AEJ:Macro (I personally would have loved to see that in a top5 since it is so unique and the first of its kind)1. This is important since traditional urban and EG models with their external increasing returns to scale (the “Marshallian trinity”, as Krugman calls it) cannot rationalise this. In other words, the old “iron law” that if you put people close to each other, you make them more productive doesn’t seem to hold up in the same way in the context of the recent urbanisation we saw in the developing world. Also historically urban size was always correlated with wealth, but at some point during the last century this correlation started to disappear. Jedwab, Christiaensen, and Gindelsky (2017) already showed in a previous paper that one of the things that are different when it comes to urbanisation in the “third world” is that there is a natural increase in population (historically, due to the disease environment, there always had to be migration from the countryside in order to let cities grow). In another recent piece J. V. Henderson et al. (2018) conclude that the pre-conditions for early vs. late “urbanisers” where quite different: the former, say cities a few centuries ago, inter alia needed good first-nature geography (climate, soil quality, etc.) in order to feed their population. A well known fact in the literature on the history of urbanisation: the extent of a city was limited by the agricultural power of its hinterland. But once transport costs dropped, this was not as important anymore and market access mattered much more since they now could bring in everything cheaply. This is all exciting new stuff. And I am sure there is a lot more coming. Now to the actual story. On my way to do archival/fieldwork in conjecture with a conference attendance in Goa2, I decided to stay one night before and after my flights to/from Goa in Mumbai in order to get to know the city and to avoid long layovers on my way from and to NewArk. Mumbai is the richest city of India, the second capital of the country, and thus not quite Lagos, Kinshasa or Dhaka, but still: almost half of its people live in slums, it is cursed by its bad geography, therefore average commuting times are insane, and roads are congested like crazy. Population-wise it is bigger than most European countries. As compared to the Western world, the dimensions of inequality are striking: a large amount of people not even able to afford housing in slums is dwelling next to people from a growing rich upper class that has its residences in regions like Malabar Hill, classifiable as multi-millionaires by any Western standard. Thus I felt like Mumbai is one of those places that anyone who is interested in contemporary urban dynamics has to understand to some extent. 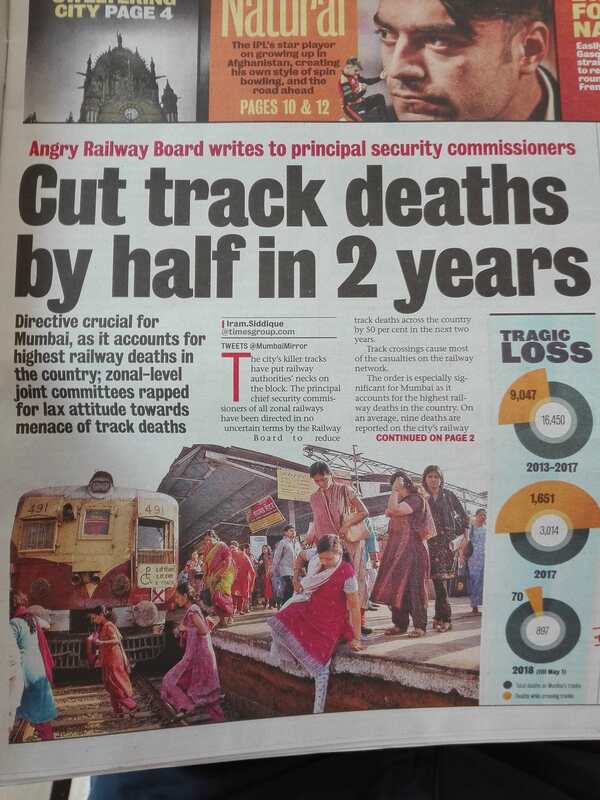 The most important thing upfront: avoid to live in Colaba at all cost if you can. This is the most touristy area (even though you barely see any western tourists) and that attracts scammers and fraudulent people. I was living there for the first night and afterwards I felt like I don’t want to come back to Mumbai. The people you will encounter there are not a representative subset of Mumbaikars/Indians. You constantly get approached by guys that are trying to rip you off in diverse ways, and compared to e.g. the tourist-scammers from South-East Asian countries, those guys are really aggressive and much more pushy. Fending them off really saps a lot of energy and after a few hours it gets annoying to a degree that you just want to get out of there. One week later I was closer to the airport in the North, walking through packed residential areas with crazy traffic, exposing myself in completely crowded markets and riding jammed trains. Not a single person approached me, literally zero. Sure, sometimes people shout after you and you get suspiciously stared at a lot of course, but this is just the natural level of racial skepticism. This made me completely revise the picture of the city that I internalised during my first night and I felt like I experienced the true spirit of Mumbaikars. To capture the former you have to visit slum areas. Depending on where you go, it is said that it is safe to go on your own. By doing a guided tour, however, you get much more out of it. There are several people doing those tours through Dharavi e.g., one of the most densely populated places on the earth3. A sketch of the proposed journey. 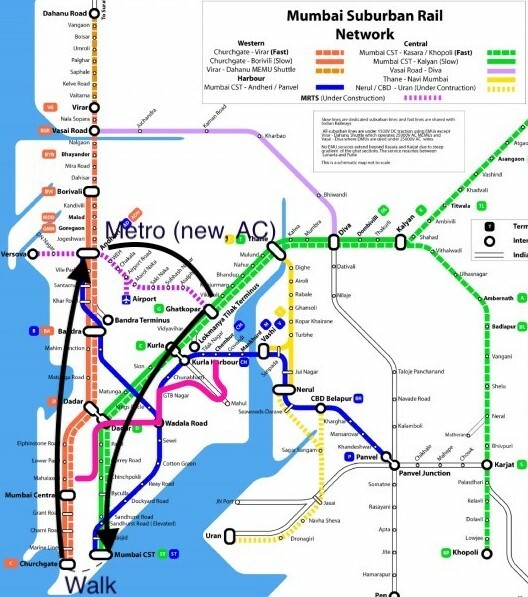 Note that the Central line is a lot crazier and cramped than the Western as the latter connects more upscale parts of the town. Thus the schedule is to go inbound via the Central, this means the risk of not getting out of the train at the right station due to “packedness” is zero, since everyone is getting out at the terminal station (C.S.T. - an architectural jewel). The main things to keep in mind are to put all valuables in your bag and hold it safely in front of you. And to obey to the rules, i.e. push and get pushed. Rush hours are also to be avoided. Obviously it is a lot less crowded on weekends. During the walk to Churchgate you can have a look at most of the downtown architectural sights, there is a lot of information on them to be found in tourist guides etc. You will also see the huge cricket playing grounds, which are seemingly the only amenities in form of public space that Mumbai provides. Churchgate is a very small station and it is straightforward to navigate and get your ticket up to Andheri. Another advantage of going outbound from Churchgate is that you cannot get on the wrong train as all of them are commuters and no intercity train is departing from there (to the best of my knowledge). The only distinction between trains is whether they stop at every station or not (S for slow and F for fast), which is also the same for the Central Railway. Here you can find a train map that visualises the stations and also which trains (S/F) stop where. Tickets you can buy at each station at the so-called “Booking Office”. It is often not straightforward to find them, but they are usually on the ground level on one side of the respective station. There are yellow signs, often not easy to spot, which are leading to them. But if you ask around, my experience was that people are very helpful. It is suggested to buy a first class ticket in order to play it safe. The carriages are the same, but are not that crowded due to the higher price. They are located near the women carriages on the front/end of the trains. Depending on the situation and the volume of people, you can still go for the ordinary coach (suggested, in case you have the feeling you can handle it). Have some coins ready for the trans-women that are passing by to bless you. Don’t give all of them to the first one, there is likely another one showing up on your journey and you don’t want to piss them off. Otherwise you get cursed (and who wants that really?). One feature of Mumbai is the never-ending trash everywhere. But when you pay attention to how often people just throw their garbage out of the door of the rolling train during your ride, you will be surprised by how little the railroad tracks are actually littered. So it seems the trash collectors you see walking along the rails do a pretty good job. Trash that then is inter alia recycled in Dharavi. It’s fairly straightforward to ride the Metro to close the triangle: it is like anyone you have seen in every bigger city around the world. Even has air-conditioning and is pristine inside (actually also the carriages of the railway lines can keep up with the average MBTA train that goes into Boston). Tickets you get at counters in every station, just tell them where you want to go. The only thing that’s different from your average Metro is that the standard Mumbai transport etiquette applies: you get pushed a lot and you have to push a lot. There are no friends on Mumbai public transport. Plus, as an article that I read this morning in the news suggests, the trains are quite dangerous relative to Western public transport (which shouldn’t come as a big surprise when you see the pictures of how packed the trains are). Some of my thoughts and expierences were already flowing into the text, but most of them I need to spare you for the sake of brevity. Historically speaking it is important to keep in mind the tremendously important role that Mumbai played for the British when it came to the establishment of their rule over the sub-continent. The transfer of Bom Bahia in the form of a dowry for Catherina de Braganca gave them a first stronghold on the West coast, completely independent of the dominions they had so far in Bengal. Thus geo-strategically this has to be viewed as an absolute milestone for them on the way to the company rule. Lastly it is worth noting that Mumbai is starting to increasingly construct taller buildings. Also in most of the slums this process is taking place, albeit the buildings there are only something in the range of 10 stories. This was historically not easily possible due to building restrictions (and is still not possible in the South, since those areas are reclaimed). This increase in living space should provide ease to the rising housing prices and also make it cheaper to run public goods due to the increased density. Thus making the city overall a better place to live. Glaeser, Edward, and John Vernon Henderson. 2017. “Urban Economics for the Developing World: An Introduction.” Journal of Urban Economics 98: 1–5. Henderson, J. Vernon, Tim L. Squires, Adam Storeygard, and David N. Weil. 2018. “The Global Spatial Distribution of Economic Activity: Nature, History, and the Role of Trade.” Quarterly Journal of Economics 133 (1): 357–406. Jedwab, Remi, and Dietrich Vollrath. forthcoming. “The Urban Mortality Transition and Poor Country Urbanisation.” American Economic Journal: Macroeconomics. Jedwab, Remi, Luc Christiaensen, and Marina Gindelsky. 2017. “Demography, Urbanization and Development_ Rural Push, Urban Pull and ... Urban Push?” Journal of Urban Economics 98: 6–16.